WE all need a reason to keep going in life, in work and in our relationships. For some, it's a matter of habit. And for others, it's because they see no choice. It is our ability to hold out hope for a better future that defines us as the human race. And yet, it's the rat race that we tend to get caught up in instead. With all its enticing lures and hoops we must jump, it's pretty easy to lose our sense of direction. In an attempt to make sense of what drives us, I decided to attend a talk on human motivation last week, albeit after some hesitation. Nothing against such speakers, and I'm sure that they have helped others change their perspectives about life, but I have attended quite a few of these conferences and workshops over the years and I have always felt like they were more style than substance. At these events, the speakers are usually charming and funny, they sell and autograph books, and end off by plugging their consultancy services or more workshops. To me, people who attend probably want an injection of adrenaline or inspiration - the short-lived feel-good factor - that comes with such events. And let's not forget why companies want to send their staff to attend such talks in the first place - of course they want their staff to be more motivated and work harder. But despite my reservations, I was determined to keep an open mind this time around. Helle Bundgaard, founder of Danish company Motivation Factor, was here in Singapore last week to speak on sustained motivation, based on "modern brain science". To sum up, it all came down to a Hierarchy of Motivation, which features four different levels, depicted as a pyramid just like Maslow's Hierarchy of Needs. For Ms Bundgaard's version, the four tiers are: energy, needs, talents, and at the apex - purpose. When we take into account factors that drain or enhance our energy (usually people), better understand our unmet needs, and leverage on our natural talents to fulfil our purpose, we are often able to better motivate ourselves. I got the opportunity to chat with her after the session. In fact, I felt that I learnt more through our short conversation because it got straight to the heart of it. My first question to her was a pertinent one, especially in the Singapore context. Why do people continually stay in ruts? In other words, why people choose to remain comfortably miserable instead of looking for alternatives. Her response, to me, was spot on. Ms Bundgaard says: "A lot of people settle. I think they settle because there's so much complexity in the world, and people might not be able to manage it in the best way." As a result, people feel powerless and they become de-motivated and disengaged. She added that it is a trend that she sees in Europe as well. To stay motivated, she suggests some practical steps. First, put into words what's in your way - what your "energy drainers" are that's stopping you from enjoying your work. According to her, it seems that 80 per cent of energy drain comes from other people, while the remaining 20 per cent is created by ourselves. I suppose the solution is not to avoid people altogether, but to figure out what's the root cause of the conflict and find a way to manage it instead of letting it simmer under the surface and causing you to dread work. She adds: "When your expectations don't match your life circumstances, there are only two things you can change: your expectations or your circumstances." Secondly, she proposes understanding what needs of yours are being compromised or unmet, and see what you can do about it. We all have some things in life that are what I call "untouchables", meaning that they are key priorities that we cannot miss. For some, it could be having dinner with the family every night. Anything that gives your life meaning. Apparently when needs are not met, it invokes the stress response that hijacks the brain. Ms Bundgaard also talked about using our talents. Often, we mix up our competencies with our talents, she says. "You can be competent at something, but it doesn't give you energy." When I asked her if discipline can trump motivation at work, her answer surprised me. She answered in the affirmative, saying that there may be other goals that the person might pursue. For example, maybe the job you're in doesn't motivate or excite you, but there's a higher purpose of providing for your family. Most significantly, she believes that people without motivation in their work won't reach excellence in their careers and that they won't be happy in their jobs. And happiness from a purpose-led life should always be something to aspire to, she adds. While Ms Bundgaard did make some good points, I can't exactly say that it was revolutionary to me. It almost seems like common sense, just perhaps packaged in a framework that makes it easier to understand. After all, it's not that hard to imagine that employees want to be able to have their needs met or that they want to be able to make use of their innate talents. It's not that employers don't know what drives staff. It's just that most bosses never think it's a priority. Talking is the easy bit - it's the implementation in the workplace that's always harder. Whether motivation is about the heart or about the brain, I think ultimately it's up to the individual to take responsibility for it. The easy way out is always to settle. If you don't want to help yourself get out of a pit that you're in, no amount of motivational pep talk is going to lift you out of it. 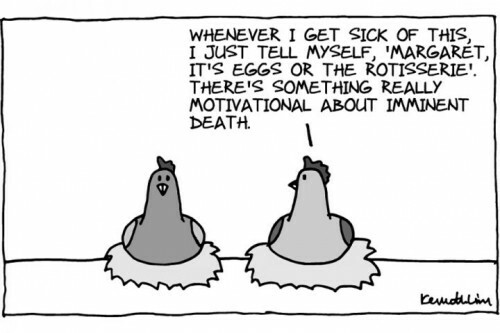 And besides, motivation is not going to last forever. It's pointless to get too hung up about "feeling motivated". No matter how much one wants to achieve a goal, there will be times when you just don't feel like it. But if you make discipline a habit, that will keep you on track to reach the goal you set out for yourself. But hey, take my musings on motivational talks with a heap of salt and by all means attend one if it's a topic that appeals to you. At the very least, it helps you build self-awareness so that you learn a bit more about yourself and the unique way you function. But just remember that all this knowledge needs to be acted upon - words without deed is dead.